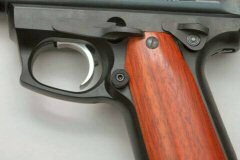 I recently converted the grip frame of my Ruger® 22/45™ to accept 1911 grips (refer to my article Converting a Ruger® 22/45™ to Accept 1911 Grips). 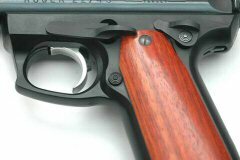 However, the new grips were thick enough that it was difficult to press the magazine release button. So I decided to install an oversize magazine release button. These buttons are designed for 1911 pistols, but will also fit on the 22/45™. I purchased one manufactured by Ed Brown from Midway USA. First I made sure the gun was unloaded, and then I completely disassembled the grip frame. The instructions that came with the button stated that I needed to drill a 3/32” hole in the center of the magazine release to a depth of 1/4“. They recommended using a 3/32” ball end milling bit. Since I have a mill and a 3/32” ball end bit, this is what I used to mill the hole in the center. Next I took a 4-40 tap and carefully tapped the center hole using plenty of tap oil. Since all I had was a taper tap, I ground some of the end off to make it a more like a plug tap. This allowed me to tap more threads before bottoming the tap in the hole. The milling and tapping process left a slight burr around the top of the hole, which I removed with a flat jeweler’s file. I cleaned the tapped hole with a shot of brake parts cleaner and reassembled the grip frame. The grip panel was now interfering with the extended magazine release button so I had to grind a relief in the edge of the panel so the magazine release would move freely. Prior to installing the new button I put a drop of Loctite blue on the threads of the set screw so it would not come loose. Now I can reach the magazine release very easily with my right thumb. Although I used a mill to make the hole, if I was going to use a 3/32” drill I would have used the extended button as a guide to ensure the hole was centered, and I would have used a drill press to ensure the hole was straight. © Copyright 2009 Roy Seifert.